Grenada's housing market grew significantly in 2015, and this positive trend is expected to continue in 2016. "The past year has been a good one for Grenada. After nearly seven years of contraction and stagnation caused by the global economic collapse we are finally seeing trends of stabilization and signs of growth in the real estate market," according to Paula La Touche-Keller, owner and broker of Century 21 Grenada Grenadines. In 2015, total sales transactions in Grenada amounted to US$ 40.8 million, an increase of 71% on 2014's transaction value of US$ 23.8 million, according to the Grenada Real Estate Market Report published in January 2016 by Century 21 Grenada Grenadines. On average, there were 40 transactions per month in 2015, similar to the past 3 years - but the average transaction value has surged, increasing by 64% y-o-y to US$ 84,772 in 2015. The report noted that the increase in values was partly due to several luxury villas transactions during the year. The recovery of Grenada's market is thanks to the US and UK economic recoveries, as most international home buyers in Grenada come from these 2 countries. Although foreign buyers make up only 7% of transactions, their share in terms of value is significant. An investment in an approved real estate development worth US$ 350,000. The Pointe at Petite Calivigny - A residential resort and marina containing 4 luxury 2-bedroom villas and 12 condominiums. Foreigners can buy land in Grenada. Non-nationals must pay Alien Land Holding Tax, at 10% of the property's value, which secures them an Alien Land Holding License. In general, yields are around 4.3% for properties in Grenada’s coastal areas, the center of the rental market. An average 200 sq. m. house bought at around US$600,000 can be leased for approximately US$2,500 a month. This would generate an income of US$30,000, 4.8% of the property's value. Bigger properties produce lower yields. Rents in the islands are predominantly seasonal but this figure is for long-term leases. Rental Income: Gross rental income is taxed at a flat rate of 15%, withheld by the tenant. Inheritance: There are no inheritance taxes in Grenada. Residents: Residents are taxed at a flat rate of 30% on their income. 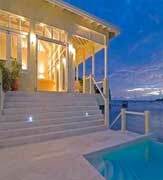 Roundtrip transaction costs for foreigners are between 32% and 43% of property value, the highest in the Caribbean. The Alien Land Holding License costs 10% of property value. Foreign buyers must also pay Property Transfer Tax, at 10%. In addition, non-national sellers also pay Property Transfer Tax at 15%, on top of the buyer’s payment. 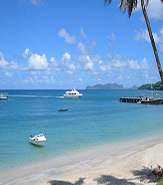 Grenada citizens selling property only pay 5% Transfer Tax. Rent: Rents and rent increases can be freely negotiated, but rent increases can be reviewed under the Rent Restriction Act. Tenant Security: The landlord must give notice terminating the rental agreement before repossessing the property. It takes an average of 180 days to evict a tenant. In elections on February 19, 2013, Keith Mitchell's New National Party (NNP - conservative) swept all fifteen parliamentary seats with 59% of the vote, and the moderate opposition party, the National Democratic Congress (NDC - liberal), undermined by the weak economy and internal squabbles, lost all representation, despite winning 41% of the vote. Many ministers in the previous government had spent their formative years under Maurice Bishop, leader of a socialist revolutionary government from 1979 and 1983 (in 2009 the airport was renamed Maurice Bishop International Airport in his honour). Faced with a stagnant economy after 2009, the NDC government fell apart, in dissention over to whether to stimulate the economy by spending, or pursue economic reform. The new government is reformist. Prime Minister Mitchell has the distinction of being the only Caribbean politician to sweep all seats on two separate occasions, in 1999 and 2013. Because there is now no opposition in Parliament, Governor General Carlye Glean, the titular head of state, has appointed 3 Senators to the (wholly appointed) Senate, to serve as de facto opposition. The Grenadian economy expanded by around 4.6% in 2015, backed by the construction sector's rebound, as well as by growth in agriculture and tourism, according to the International Monetary Fund (IMF). This followed much stronger expansion of 5.7% in 2014. In 2016, the economy is predicted to grow by 3%. Grenada was once one of the Caribbean's fastest developing economies. Its GDP grew by 7.2% p.a. 1997-2000. But GDP fell by an annual average of 0.7% annually from 2008 to 2013, due to the impact of the global economic and financial crisis. The economy only rebounded in 2014. Grenada has a very high national debt, at around 100% of GDP. Unemployment is very high at around 30%, with youth unemployment of over 50%. In 2013 the new government entered selective debt default and agreed restructuring with some creditors at 50c in the dollar. It also entered into a three-year US$21.7 million Extended Credit Facility (ECF) arrangement with the IMF in June 2014. Grenada's fiscal performance has recently been strong, with a primary fiscal surplus of 2.2% of GDP in 2015. The country's debt-to-GDP ratio declined from 107% in 2013 to 92.7% at end of 2015. Based on the IMF's recent review, the government met all performance criteria in 2015. "Stronger activity, recent revenue measures, and improvements in tax administration contributed to higher revenue collections, and current expenditure was contained," said the IMF. "The key priorities in 2016 include execution of the budget in line with program commitments and the new Fiscal Responsibility Act (FRA); focused reforms to ensure prudent and sustainable management of the public sector wage bill; application of the new system to register beneficiaries for social assistance; and follow through on growth-enhancing reforms in the areas of business facilitation and labor legislation," according to the IMF. Grenada's currency is the East Caribbean dollar (XCD), which has been pegged to the US dollar at 2.7CD since 2001.